Announced in August of 2010, Bioshock Infinite has been on many gamer's radar for quite some time. After a couple rounds of delays, the game's attachment to the original Bioshock's legacy, and what some might feel was already a bit too much hype; expectations are as high in the sky as the story's Columbia setting. 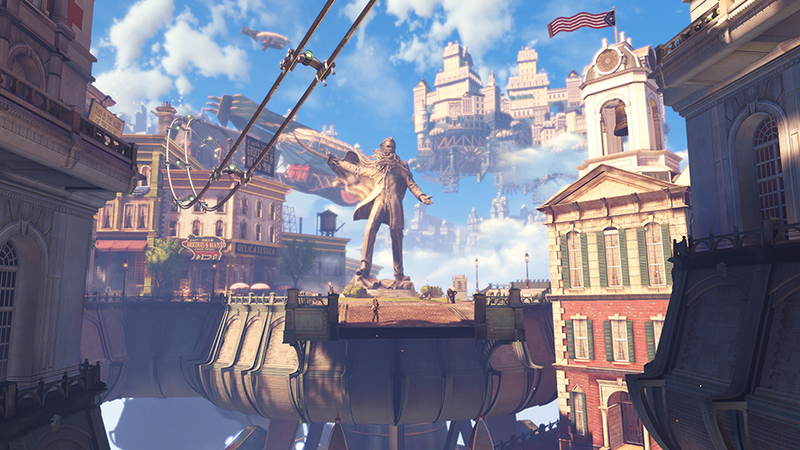 The story and world of Bioshock Infinite are, without a doubt, the stars of the game. Kevin Levine and company showed ambition in their efforts, the likes of which, more AAA game titles should try to emulate. The game begins in an alternate 1912 where a thriving, if not a little sanctimonious, city of Columbia floats high above the rest of the world. How? Well, through technology created by Rosalind Lutece but that's another side to the story. You play as Booker DeWitt, an ex-Pinkerton with a major debt on his shoulders. He'll do pretty much anything to wipe away that debt, so when asked to "bring us the girl" by some mysterious employers, Booker jumps at the chance and finds himself wandering the streets of Columbia in search of Elizabeth, a captive of the city's founder and prophet, Zachary Comstock. I doing so, you begin to see the other side to Columbia's coin...including a subversive group, the Vox Populi, who is setting the stage for a revolution against Columbia's rampant racism and imperialistic American furvor. 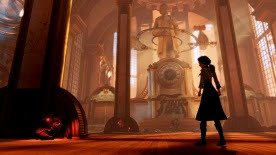 Again she story is indeed the highlight to the game and after completion I found myself like many, wading into the Internet to make sure I had a near full grasp of what had happened. I had the broad strokes down right, but am glad to have consulted the hive mind of video-gamers to pick up on some of what I had missed. 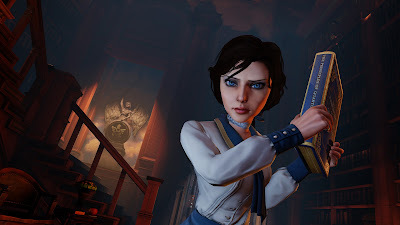 It's the little things that demonstrate how Irrational Games really did have this twisting, spinning, and flipping story laid out to completion. This is a yarn that would make Rod Sterling proud. 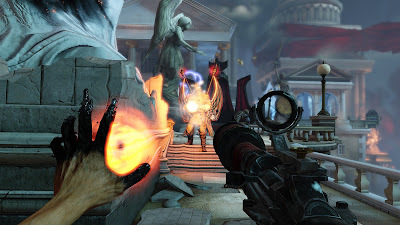 Bioshock Infinite is a First Person Shooter that plays quite different than any other shooter, first person or third person, that I've played this generation. The challenge is less focused on accuracy and reflex associated with your shooting. It's also not too concerned with running or jumping, however, the "platforming" elements that do present themselves in Bioshock Infinite require more accuracy in aiming your Skyhook or dismount than most of the combat in the game. 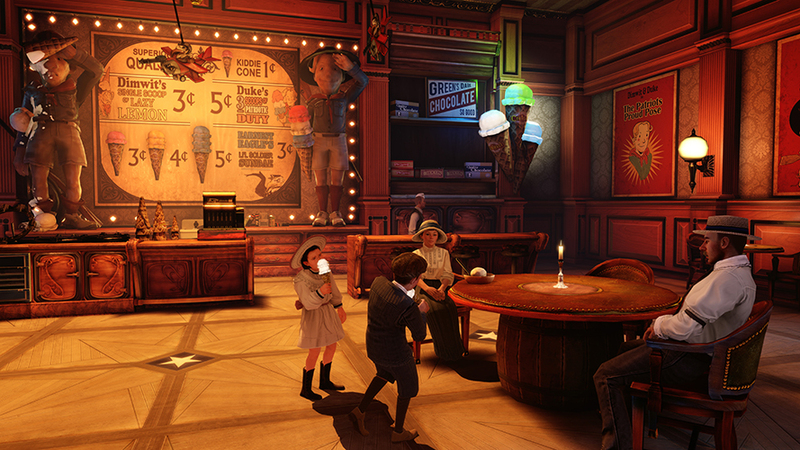 Combat itself is a bit...off in Bioshock Infinite, at least when talking about the console experience. The game goes as far to have onscreen reminders to use your superpowers, called Vigors in this outing, however the limitation of having only two Vigors at the ready makes them seem more of a supplement, like a grenade, rather than a key offensive advantage. Throughout the game you collect several different vigor abilities, but to access them, you need to pause the action by holding down a shoulder button and cycle to what one you want to replace with another. This limitation led to me settling on my two or three favorites and sticking with them, pretty much ignoring the added fun of experimenting with combinations. (For example shooting crows at an enemy followed by a burst of fire would set the birds aflame and increase the resulting damage). Shooting was my mainstay (perhaps a bit too much Battlefield or Uncharted still in my system) but wasn't as satisfying as I'd hoped (shotgun not included in that statement...it was very satisfying). I'm not a fan of health bars being on every enemy as it takes me out of the experience and has me second guessing the game designers efforts mid-game. "What do mean that shot to the throat barely caused damage?!" The best parts of gameplay came either at the onset of a conflict, where you could set up one of those fore mentioned Vigor combinations, or more often, in simply exploring the environment in a first person world. Walking around was done quite well, and as odd as it sounds, the game should be commended on its ability to keep the player entertained when NOT in combat. And it's in those non-combative moments that I found myself more engaged in the game world. Exploring the city of Columbia is really what you're set out to do. Walk around, allow the story to unfold, and leave no stone unturned so-as to keep you stocked up on ammo, health, cash, and salts. Cash, which you'll use in Columbia's vast amount of vending machines to buy and upgrade your arsenal and Vigors is everywhere, whether you're looting it from fallen enemies, dead citizens, or trash cans. Yes, there is no shortage of cash carelessly thrown away in the trash. I may have to start searching my office trash bins. With exploration being a gameplay element, and a requirement to have the whole story unfurl, the designers did a great job of guiding you to do so. On more than a few occasions though, I found myself quickly scanning an area for the tell-tale-blink of loot as opposed to really taking in the environment. With such a beautiful game world, we don't want to "miss the forest for the trees" and my constant search for goodies often took precedent. An added method of traversing Columbia is its Skyline rail system. In my play through, this creative addition was used less frequently than I had envisioned, but still managed to be fun. It's almost as if it was an added mini game to successfully use it to occupy strategic positions, find loot, and conduct areal attacks. The presentation of Bioshock Infinite needs to be split in two, at least when discussing it having been played on the PS3. The art direction and design of the world and it's inhabitants was fantastic. The mixture of period architecture, steam punk fantasy, and Gothic monumentalism (I think I made that last word up) is a joy to behold, though I did find the 'ol dual staircases leading to the next floor and ridiculously high ceilings a bit redundant after some time. The technical execution on the PS3 was a little underwhelming. Just as a parent is disappointed when their children don't live up to their potential, I imagine a similar feeling among the Irrational staff on putting the console version out into the wild. Textures and characters just don't feel alive. There is an irony to this in that Columbia is chocked full of automatons and animatronics, and sadly the non player characters, including the game's pride and joy, Elizabeth, have no more life shining through than the former. Animations are choppy, facial expressions are there, but don't feel as natural and conversational as they've attempted, and most citizens have their feet glued to the ground as if their straight out of the "Hall of Presidents". The voice acting was good, and the motion capture for Elizabeth was fine, though I don't see Naughty Dog being shown up in either category. 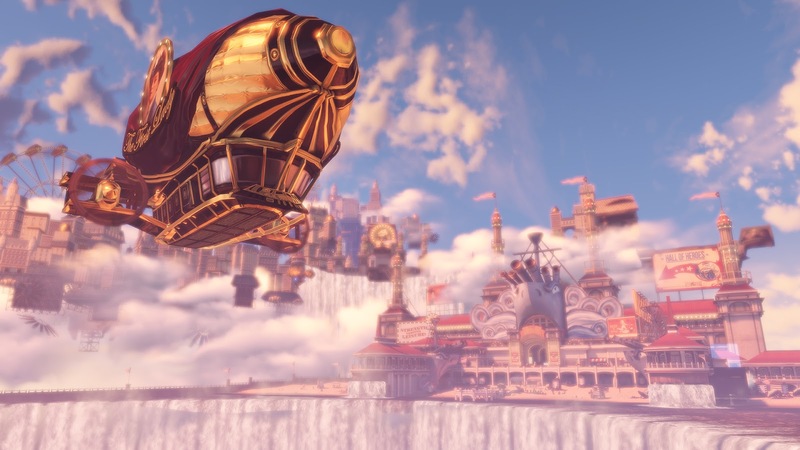 When I finished Bioshock Infinite it was clear that the story was the main event and the "game" is just the price of admission. That being the case, my initial reaction to my wife was that maybe it would have been better as a book. Later I thought, well, if it was a book, then the art direction would have gone to waste...maybe it would have been better as a movie. But then I thought, well, if it was a movie, you wouldn't have been able to "experience" the environment as you do walking through Columbia's numerous museum-esque buildings, many containing monumental dioramas dedicated to this or that. That's when it hit me, that Bioshock Infinite, is best described as a ride. I wonder if that was part of the intention with the Skyline rail system; an overt nod to this game being a virtual theme park based around a good story. Walking around Columbia is in many ways like riding the old Pirates of the Caribbean or Mr. Toad's Wild Ride at Disney World . You move from vignette to vignette, look around at this environment, look around at that one. Oh yeah, you're part of the story so shoot at this thing...now shoot at that. Ok, now go ahead and press this button to move the story forward, even though you're already here and it wouldn't make sense NOT to press that button. Certainly this isn't the only game with such traits, but with the creative environment and story telling through architecture. This feels almost more so. Even the recordings you find and listen to are akin to audio tour tapes while you look around whatever room you've found them in. My impressions are skewing negative, but I'm not trying to describe this as a bad experience because the experience was good. As a game though, I don't see new ground being broken or any elevation of the medium as an art form. Maybe my expectations, were a bit high. I guess the bottom line would be that I would love to see more games with such thought and originality brought to the story and environment...and I'd love to see a bit more game brought to Bioshock. 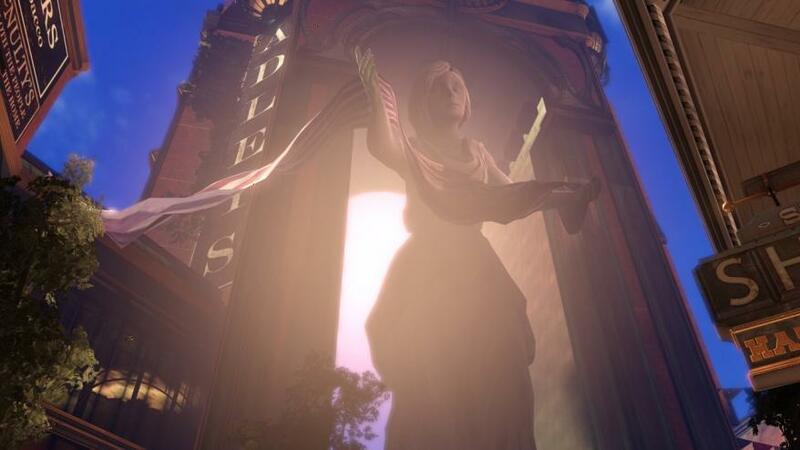 Bioshock Infinite was developed by Irrational Games and Published by 2K Games.